Raphael was born in Curitiba, South Brazil, showing interest in wild animals since he was a little child. In 2001 started his studies on bird communities, as soon as he entered the university. Until nowadays, he spent more then 9 years dedicating his full time to the birds. His experience provides him knowledge to guide birding groups around many portions of Brazil, including Amazon Forest, Pantanal, Cerrado, Atlantic Forest, Araucaria Forest, Southern Wetlands and Pampas. 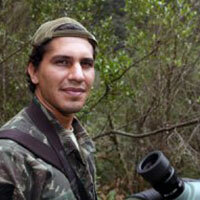 Last year he coordinated the study group and wrote the book Action Plans for Threatened Species in Paraná State. He had published several scientific articles in specialized magazines in South America and he is also the co-author of the book Birds of Curitiba: a Records Collection. Actually, he have been leading lots of groups and he has experience with the birds of Brazil, Australia, Colombia, Argentina, Uruguay and Bolivia. He’s also an environmental consultant and develop studies for many important companies like Petrobrás, ALL, Renault do Brasil, Eletrosul, Furnas Centrais Elétricas, etc. He is good with bird song and have an important collection of rare birds recordings. He is very friendly and a responsible person.